Ditropan and Ditropan XL are drugs used to treat bladder disorders. They are used to relax spasmodic (hypertonic or tense) bladders. The generic name of both these drugs is Oxybutynin chloride. The main difference between the two is that Ditropan is a regular use steady state tablet whereas Ditropan XL is an extended release tablet. An extended release tablet releases the drug slowly over a period of time so that the drug levels remain consistent over a 24 hour period. This way the dosage per day for Ditropan XL is less as compared to that of Ditropan. Also since the medicine Ditropan has to be taken less often as compared to Ditropan, the former has lesser side effects. Ditropan XL is a once daily controlled release tablet that is prescribed for patients with over active bladder like urgency, increased frequency etc. 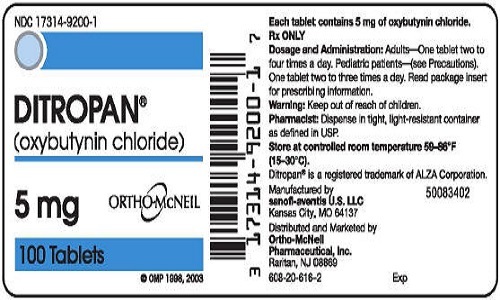 Ditropan XL can also be given to children above 6 years old who suffer from incontinence issues due to neurological disorders like Spina bifida etc. The drug reaches its peak concentration in around 4-6 hours. On the other hand Ditropan is usually given in a twice a day or thrice a day dosage pattern. The drug reaches its peak concentration in the blood by 2-3 hours after consumption. Ditropan cannot be given to children below 5 years of age. These drugs are very strong and should be taken as per the prescribed dosage/measurement and timing. Dosage should not be increased or skipped without consultation. The patient should make sure to take the drug at the same time each day. The tablet must be swallowed as a whole and should not be crushed or chewed as that will result in release of the drug contents in one go. This can be dangerous. Both these drugs are indicated in patients with bladder disturbances, especially those suffering from bladder emptying problems like neurogenic bladder, urge incontinence, urgency etc. The drugs are administered orally in the form of tablets or syrup. The drugs act on the smooth muscle specifically and do not have any effect over the neuromuscular junctions of the skeletal muscle. These drugs exert their antispasmodic action by acting on the acetylcholine receptors on the neuromuscular junction of smooth muscles. Both these drugs are known to cause angioedema, cessation of sweating, blurring of vision, drowsiness etc. It can cause gastrointestinal side effects like nausea, vomiting, constipation and dry mouth. These drugs can affect the functioning of the kidney and heart. If these get severe, the patient must visit the doctor for further check-up. Over dosage of the drug is associated with increased central nervous system activity, increased urinary retention, cardiac arrhythmia, vomiting and dehydration. Maitreyi Naigaonkar. "Difference between Ditropan and Ditropan XL." DifferenceBetween.net. June 11, 2015 < http://www.differencebetween.net/science/health/difference-between-ditropan-and-ditropan-xl/ >.